Abstract: Part of the grey literature, electronic theses and dissertations (ETDs) represent a growing segment of open, available content in institutional repositories (IR) where they contribute to the impact and ranking of their institution. More than half of all IRs listed in the Directory of Open Access Repositories contain ETDs. Most of these open access projects have similarities and common features, such as access to full text and compliance with the OAI metadata harvesting protocol. But more important are the differences, with regard to metadata, policy, access restrictions, representativeness, file format, status, quality and related services. In this paper, we investigate what can be done to improve the quality of content and service provision in an open environment, in order to increase impact, traffic and usage. Based on a review of 54 recent communications and articles on PhD theses in institutional repositories, this paper shows five ways in which institutions can add value to the deposit and dissemination of electronic theses and dissertations and describes two developments that are challenging institutional repositories. Abstract: We propose the "Digital-Surrogate Seal of Approval" (DSSOA) as a simple way of describing digital objects created from printed books and other non-digital originals as surrogates for the analog original. The DSSOA denotes that a digitization accurately and completely replicates the content and presentation of the original. It can be used to express an intended goal during the planning stages of digitization and to guarantee the quality of existing digital surrogates. The DSSOA Criteria can be used to evaluate individual digital objects or entire completed collections. DSSOA is independent of production technologies and methodologies and focuses instead on the perspective of consumers  including libraries that rely on digital surrogates. Abstract: Academic libraries were among the first adopters of mobile websites in universities, but much of the early development was focused exclusively on traditional library content such as the library's homepage, catalog, contact information, etc. As libraries continue to work on new technology developments, a mobile interface for their institutional repositories can be a good new way to reach out to faculty and other interested parties. Miami University's Scholarly Commons runs on DSpace as part of a shared infrastructure administered by OhioLINK. DSpace is used at academic institutions, research and resource centers, museums, national libraries, and government and commercial organizations. With over a thousand installations in more than 90 countries, DSpace is the most widely used open source repository platform by any measure. The steady popularity of DSpace suggests that a lot of institutions will benefit from an out-of-the-box mobile interface. This article describes the development and implementation of the first mobile interface developed for DSpace using the jQuery Mobile Framework. Abstract: Deciding which works should be held by a university library, and how many copies of each work are required, is a time consuming process. Library staff have to consider a number of variables in making each purchasing decision, and use data from a variety of library systems. At Loughborough University one such system is the online reading lists, which allows academic staff to indicate to students and library staff which books they feel are most useful/important. This paper discusses taking data from the reading list system, and other library data sources, and using it in an automated system to make book purchasing suggestions to ease this task for library staff. Abstract: Over the past several months, the proliferation of MOOCs (Massive Open Online Courses) has been hailed as a potent defense against the rising cost and insular culture of attending a traditional college. The courses, which are generally taught by experts with affiliations to elite universities, are characterized by their unique pedagogy and unlimited enrollment. To date, no course has been accepted for transfer credit at a major on-campus institution; however some administrators and higher-education experts predict their gradual integration into university curriculum. This article examines the MOOC phenomenon, identifying aspects that academic librarians should consider in the coming years, including how these courses interact with scholarly resources and library services. Methods for integrating library services in these courses are evaluated, with recommendations for the best course of action. Abstract: The International Conference on Digital Preservation (iPRES) is an established annual event bringing together practitioners and researchers in the digital preservation community, engaging individuals, organisations and institutions across all disciplines and domains involved in digital libraries, archiving and preservation of digital artefacts. The 9th conference, the most recent iPRES, took place from October 1-5, 2012 at the University of Toronto's Chestnut Convention Centre. Before the main conference track, two days of workshops were scheduled. The workshop on emulation "Towards Practical Emulation Tools and Strategies", was one of the full-day events held on October 1st. Abstract: Experts in semantic search and related technologies, users, implementers, academic researchers, and others interested in the use of knowledge organization systems in networked environments attended the NKOS/CENDI Workshop, "Magnet for the Needle in a Search Haystack", held at the U.S. Department of Transportation Media Center on December 6, 2012. It was the tenth workshop on Networked Knowledge Organization Systems/Services sponsored by the NKOS group in the U.S. since 1998. The David Livingstone Spectral Imaging Project is a collaborative, international effort to use spectral imaging technology and text encoding to publish the original manuscripts of David Livingstone, a Victorian explorer who traveled extensively in Central and East Africa. 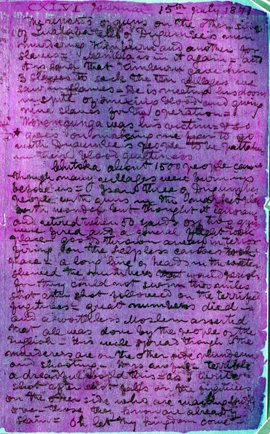 Now available online are: a full text transcription of Livingstone's 1871 Field Diary presented side-by-side with images of the handwritten diary, a transcription of letter dated February 1871 from Livingstone, and a data archive of all the raw images photographed using spectral imaging and the resulting processed images that were refined by imaging scientists. The Project endeavors to publish the 1870 Field Diary in the future. 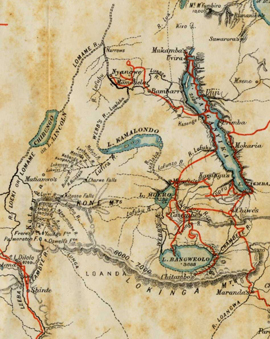 During his final expedition (1866-1873) in Africa, Livingstone traveled throughout Central and East Africa. In 1871, Livingstone spent five months stranded in a small village in the Congo, Nyangwe. At that point, he ran out of both ink and writing paper for keeping his daily field notes and took up writing with berry-based clothing dye on whatever paper he could find, including old newspapers and leaves of printed articles. While this method enabled Livingstone to keep his notes and later expand them into his larger journal, the original and unedited notes have faded and are difficult to read. However, Professor Adrian Wisnicki, a Victorianist and director of the Project, decided to seek out the original notes, suspecting he might find some information that Livingstone had not included in his more formal rendition. Indeed, the now transcribed field diary reveals a more immediate reaction and account of Livingstone's experiences in 1871. The online publication of the 1871 Field Diary includes not only the transcription and images of the Diary, but also brief essays about Livingstone, the manuscript, and the history of the project. The Project is published online by the UCLA Library and Livingstone Online.